Happy Fall! My part of the south is finally, finally beginning to see a little bit of a break in temperatures. (although I’m sure many of you would laugh that I think high 80s is a temperature break!) But this coming week looks like we may finally start to see some cool(er) nights and for that, I’m thrilled. My husband and I have grand plans to have a fire in our new fire pit and roast some marshmallows. As I was considering my post for this month, I decided to share something that’s been really helpful to me lately. Many of you have read my posts in the past and know that my family has been on a roller coaster of sorts over the last year or so, and we’ve recently moved to a new town and are finally beginning to settle in. In doing so, we’ve found a church that feels like “home” and are beginning to be involved there. I can’t tell you what a huge blessing that has been for us. Anyway, one of the very first discussion topics used a visual composed of a jar, some large rocks, and some pebbles. Many of you may have already seen this, but it was new to me. Here’s a quick explanation for those who may not have heard of this: the jar represents all the time you have in your life. The rocks equal the most important things that get the majority of your time. The pebbles are the things that are not as important, but still take up time. If you pour the pebbles in first, the jar is full. There’s no room for the rocks. But if you put the rocks in first, the pebbles will go in easily and fill in the empty spaces around the rocks. We were asked to consider our own lives and how we spend our own time. How often do we put things that should be pebbles ahead of things that should be rocks? I know I do! It’s made me consider things in a different way—I’ve had to re-evaluate how I’m spending my time and honestly, it’s not pretty! Spending time on my phone—whether it be browsing social media or playing a game, is sometimes a rock…and it should NOT be. Watching TV can be a rock for me, too…and it sure doesn’t deserve to be. I’m not saying don’t use your phone or watch TV, but I’m saying that for me, in my own life, I sometimes need to step away from those things and see them for what they are—and focus more on the things that are really important to me. Over the past weeks, I’ve been really considering how I’m spending my time. Because let’s face it—time is fleeting! Johnny and I will celebrate five years of marriage this weekend, and it seems like it passed in a blink. I think about the quote from Ben Franklin—do not squander time, for that is the stuff life is made of—and I realize that time is something you can’t get back! Psalms 90 (using the NLT here) says “Teach us to realize the brevity of life, so that we may grow in wisdom.” This is one of those verses that a few years ago I may have read over and moved on. But now, I read it with the realization that our time on earth is limited. None of us know how many years we have. So for me, I’ve really started being more deliberate with my limited hours each day. Spending time in God’s word, spending time in prayer, spending time with my family, spending time focused on work…those are the things that need to be rocks in my jar. Facebook, Instagram, my DVR full of shows, mindless iPhone games…those things are pebbles. How about you? Do you have things in your life that have become rocks…but need to be pebbles? And as a side note, for those of you who don’t read my newsletter and are still waiting on A Reservation for Romance to release, here’s the updated information! I hope you each have a wonderful month! Hi Annalisa, congratulations on your 5 year wedding anniversary:) What a blessing that you have found a small group study and are connecting with people. Thanks for sharing your insights on time- I know that there are things in my life that take up more time than they probably need, while things that need more time are not given priority, it is always good to think about priorities!! Hi Annalisa! Happy Anniversary and best wishes as settle in your new home and connect with new people in the community. Moving to a new home, let alone a new community is extremely stressful; but a learning experience and has rewards and blessings. Excellent analogy on time management. Setting priorities and taking at least some time for oneself is definantley important for one’s health. Thanks for the update on Reservation for Romance. Best wishes and enjoy the cooler weather. Thank you, Renate! Yes, we are finally starting to feel at home here. Hope your fall is off to a great start! Annalisa–Great post and a great reminder. Congrats on finding a small study group. I love that feeling of getting to know people who have the same interest in God. There’s such a loving feeling about that. And the time issue–well, it’s been on my mind a lot lately. I’m reevaluating as well. And I’m an empty nester–but still have a full time job, family in the area, and it gets to be a struggle and juggle at times. :) Thank you for the post. Thanks, Lindi! Struggle and juggle for sure! 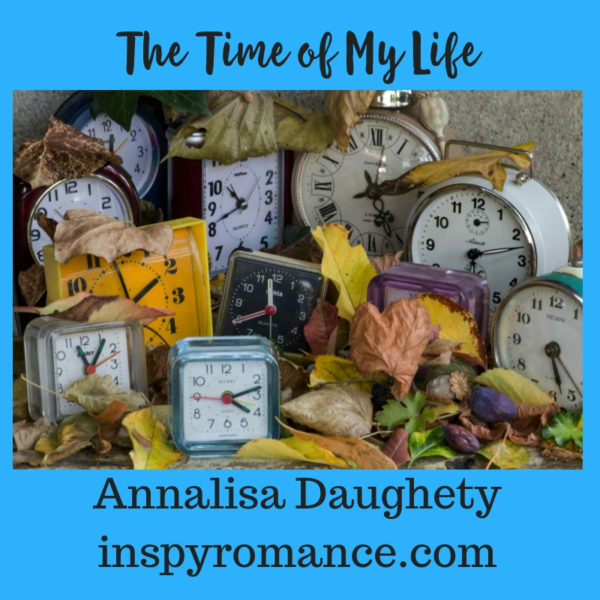 Great post on time Annalisa, I have heard the rocks/pebbles/jar analogy before, but I sure needed the reminder to prioritize the most important things, those small distractions really have a way of eating up the hours in my day. Congrats on the 5 years, I remember my own early years of marriage, in our third, fourth and fifth year we had a baby each year! We just celebrated 44 years in August, and it feels like I just blinked and here we are, so that speaks to how fast time goes by! Thanks, Tracey! And wow–congratulations on 44 years! They do fly by, don’t they? I love the analogy of the rock being the most important time and the pebbles filling in. It’s so easy to visualize something to concrete and make it applicable. Thanks for sharing. Thank you, Kimberly! The rocks/pebbles really resonated with me! I love those clocks! I have had to re-evaluate a lot of things in my life lately, but I think it will all work out for the best! Great post! Happy Anniversary and continued blessings as you settle in your new community! Thank you so much for the post Annalisa! Great reflection…I’ve been in the mood of analyzing my rocks and pebbles lately. We use this example in our Sunday School object lesson: with jar, rocks, pebbles, and sand.